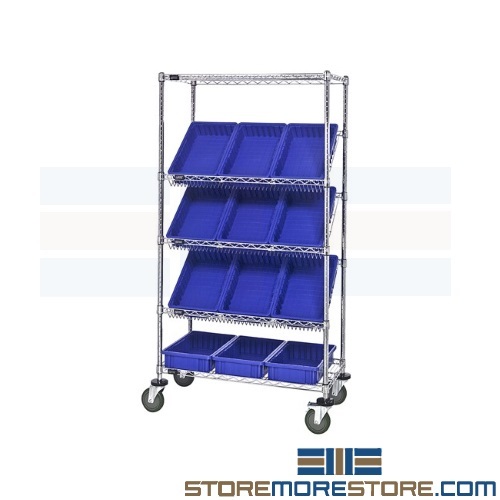 Spend less time searching for items and improve efficiency with tilted wire shelving racks and carts. With modular components, these units are easy to customize to your exact needs now and in the future. The sloped shelves allow for high visibility and gravity feed for quick identification of items and faster stock rotation. Its wire construction allows airflow and prevents the accumulation of dust or debris. Additionally, these tilted wire shelving units are available in stationary or movable options. 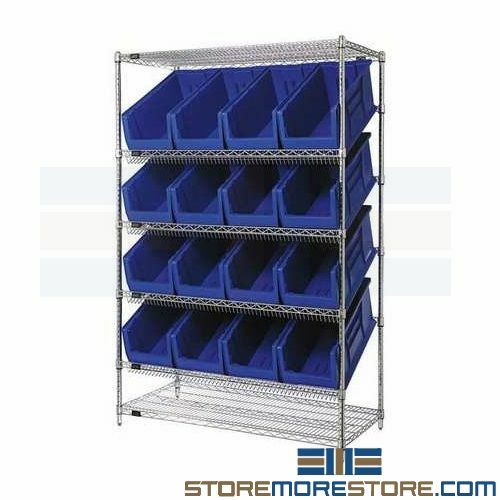 These tilted wire shelves are great for a large variety of applications such as PAR level systems, work-in-process storage, and small parts picking. An integrated bin system comes with label holders that make it easy to identify stored items. Also, the bins are sized to fit perfectly within the racks without any wasted space. It’s easy to reconfigure the system or remove the bins whenever you need. Weight capacities: up to 48″ long shelves: 800 lbs. ; 60″ shelves and wider: 600 lbs. Tilted wire shelving racks are available to buy online and ship within 10-15 days with free dock-to-dock shipping included. If you need any assistance or just want some help picking the right solution for you, please call us at 1-855-786-7667.